Your so disciplined to buy asparagus only in season. I admire that. I agree with you that asparagus should be enjoyed pure and natural, steamed or grilled – none of this turning it soups. I can’t wait to try some this weekend with soft boiled eggs. I’d have it the same as today – simple and delicious! 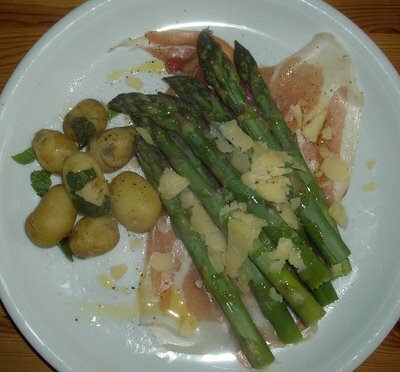 Mmm, I do love asparagus. We’ve not managed to get any so far They really do taste so much better in season. My grandmother-in-law was telling me about when she was young they mainly had white asparagus. Have you tried them? She said you starve them of light, they tend to be slightly less bitter. PS – I tried the egg curry recipe you posted, was very nice. I’ve posted an image on my blog. I did used to buy out of season then I had some that was really fresh and the taste was amazing so now it stick to seasonal – and its cheaper. Matt: Never tried white asparagus, only ever seen it in tins (ugh) maybe I need to grow some to try it! Will check out the egg curry pic.